Marble cake is always a favorite in my house. The texture of sponge cake and the touch of chocolate, for sure wins not only kids but adults and of course no need to mention the beauty of those Marble Effects. As you know, I am not a baking person yet, no no i take it back..I am not a baking cakes or sweet person, I am always up for baking some thing savory. But these days slowly experimenting with cakes and breads to improve my baking skills. I have never baked cupcakes though, that too from scratch, so never got the motivation to buy Cup Cakes Tray or Muffin Tray to bake. but during my recent trip to Dallas, the cute design of this Betty Cooker Tray win my shopping soul. The winning point is this comes with the nice lid to carry your cup cakes as it is (no need to extra carry case) and also this is the best part, it comes with the easy to assemble cup cakes stand which is part of this tray. Love their neat and slim idea of collapsible cup cake stand that comes with it. So now I need to find the opportunity to put in use this gadget. As I have made marble cake several times, I thought Why not Marble Cupcakes, it is fun for the kids to see their marble effects in their own cup cake and also eat with out making a mess. Here is the recipe, enjoy! It comes with collapsible cup cake stand. You can take your cup cakes on the go and show-off with this cute cup cake display stand. Preheat oven to 350F. Grease line 12 cups from a 12 cup muffin tin with paper cups liners. In a large bowl, whisk together sugar, eggs, vegetable oil, buttermilk and vanilla extract. Pour in dry ingredients and stir until just combined. Remove 1 cup of the batter to a small bowl and stir in melted chocolate. Evenly distribute batters into prepared muffin cups, adding a spoonful of vanilla, followed buy a spoonful of chocolate, followed by a little more vanilla. Gently run a knife through the batter to give them a swirl. Bake for about 15 minutes, until a toothpick inserted into the center comes out clean. Cool cupcakes on a wire rack before frosting. Distributing the Batter in all cups is little time taking and need to be done carefully, but it is Total worth when you see these cute cupcakes with marble effects inside. My kids kept eating until they finish them all, and that leaves one soul satisfied Mommy!! Ahaaa! Look at those beautiful marble effects. Buttermilk is to give some slight sour taste and spongy texture. You can replace that milk or egg, if you are not up for buttermilk. If you have Coca Powder handy, you can use 1 or 2 Tbsp Cocoa Powder instead of dark chocolate. You can increase the chocolate or coca powder quantity based on how dark marble effects you want or how much chocolate touch you desire in your cake. Wow looks delicious. Thanks for your reply Mythreyi abt the asparagus. Will try them out. 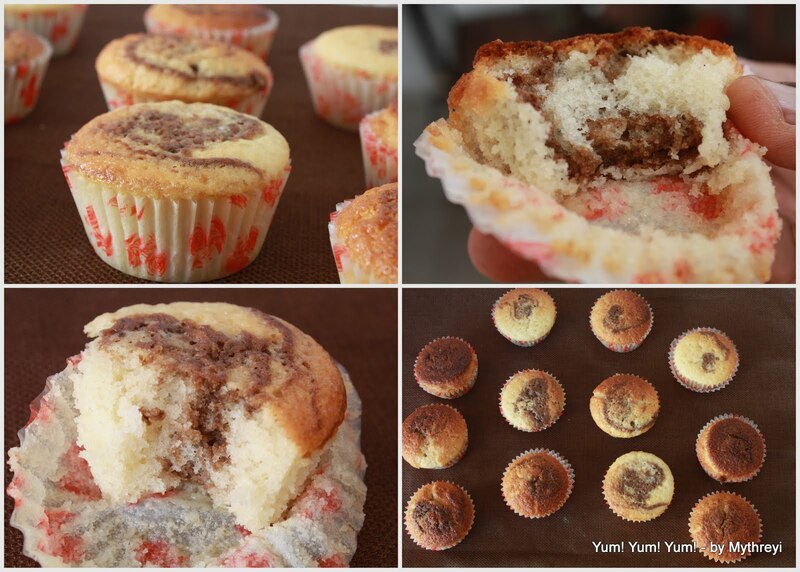 Woah, to get that Marble effect in so many cupcakes, you must have a lot of patience! Kudos! :) they look great! tell me how to follow you through google account.. Welcome to Yum! Yum! Yum! Preeti. Glad you liked the recipes. You can connect to Yum! Yum! Yum! via Facebook or Subscribe to my posts via Rss Feed.